​That was the original south end of US 51-61. Straight ahead was eastbound US 90, and westbound was to the right on Jackson. US 65 was added to the US 51-61 routing in 1936, so it shared that endpoint for a few years. ​That was (and still is) westbound US 90. But whereas today US 90 continues straight ahead, until about 1970 it turned left on Canal, and straight ahead was the south beginning of US 51-61-65. That perspective also shows what may have been an historic south endpoint of US 11. In 1937 US 11 was extended southwest from Mississippi. It joined US 90 east of NOLA, and the two routes were co-signed into downtown. 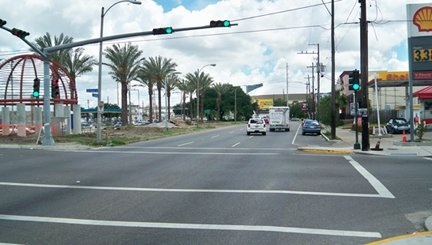 At this time it is unclear specifically where US 11 signage would have ended, but until more detailed information surfaces, the speculation is that it was at the corner of Canal and Broad. US 11 was truncated to its current south terminus in the eastern city limits in 1941. In 1951 LADoTD removed several highway concurrencies, and that is when US 51 and US 65 were truncated out of New Orleans. 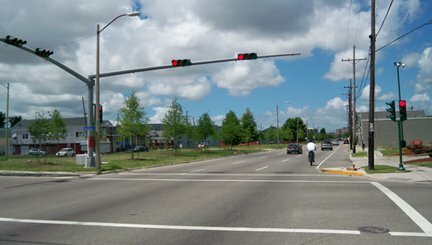 US 61 continued to end at Broad and Canal for another 20 years or so, until US 90 was changed to follow Tulane (instead of Canal) between Claiborne and Broad. 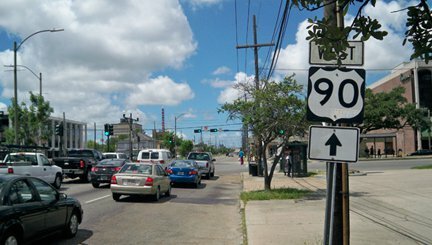 At that time, about four blocks of US 61 became US 90, so US 61 was truncated to its current terminus on Tulane at Broad. Research and/or photo credits: Martin Karner; Dale Sanderson; "Urban Prairie Schooner"
last updated Mar. 23, 2016.